Creative self expression is a fundamental human urge, practiced by every culture since the beginning of recorded history. It is a physical, mental, emotional, and sometimes, spiritual process which can encompass the whole of a human being. Art can “communicate” with us when we open ourselves to its messages, just as our dreams can. The word “empathy” was invented to describe the sensory changes a person experiences in the presence of art. Yet, art does not have to be a masterpiece to have a profound impact on a person. Art when combined with Therapy offers a powerful therapeutic form of nonverbal communication that can be just as effective for adults as for children. 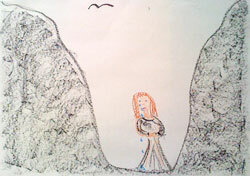 Adult artwork produced in a session often will look as though done by a child, especially if it is done with the non-dominant hand. Often a person discovers in the course of therapy that the cause of their current distress has roots going all the way back into early childhood. In a session we might use basic art materials like markers, oil or chalk pastels, tempera paint, or clay, to facilitate creative expression. Guided relaxation and visualization exercises help you prepare your imagination for visual imagery related to your concerns. The focus is on the process of artmaking itself rather than the product and we allow time to explore the meaning of your artwork together. Art Therapy is for anyone. No training or talent is needed to experience the benefits of Art Therapy. All that is necessary is a willingness to take a risk in creative self-expression. Unexpressed thoughts and emotions often emerge through the artwork long before they might appear verbally in conventional “talk” therapy. A person usually notices a shift in mood, a release of tension, a transformation in perception of the concern as a direct result of the artmaking experience. What Can I Expect from Art Therapy? Transform intense feelings, body sensations, and thoughts. Art therapy and other creative processes are used along with talk therapy to help people heal from the negative effects of recent or past trauma, including child abuse and neglect, increase self esteem, loosen emotional knots, reduce symptoms of anxiety and depression, strengthen inner resources and more. Art Therapy is a very effective process for transforming ineffective communication between couples or in families. It is an excellent tool with adolescents who often find the process of talking to adults about problems to be more than they can handle, yet are willing to express their issues nonverbally. How Does Art Therapy Help with Trauma? Recent brain research has demonstrated that when the nervous system becomes overwhelmed, disturbing experiences never reach the left hemisphere of the brain which is the part that makes sense out of our experiences. The right hemisphere of our brain may store overwhelming experience as sensation and, most commonly, as images. When the left brain cannot gain access to the traumatic experiences, the disturbance remains unresolved. The traumatic material can drop out of our awareness, becoming inaccessible to verbal language or conscious memory, only to overwhelm or trigger our arousal system again when a similar situation touches on the old unhealed wound. It is through the integration of the right and left hemispheres of the brain that trauma is resolved. When we experience trauma the tendency is to “put it behind us” and move on because it is so painful that we want to avoid it at all costs. But, it continues to be held in our body and emotional memory until the traumatic experiences can be integrated by both hemispheres of the brain. Art Therapy offers a way to access and integrate the disturbing after-effects of trauma in a safe and controlled way that promotes self-regulation and avoids re-traumatization. A man and a woman had begun couple’s counseling to clarify whether they were making the right decision to marry. 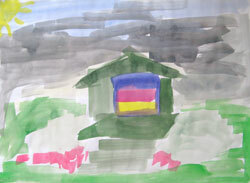 In one of their first art therapy experiences, the woman noticed that the man had put a rainbow in his drawing. She wondered aloud if it might be a symbol representing the gay community. In asking her partner about the meaning of the image they were able to begin the dialogue about some concerns relating to sexual identity, a highly sensitive issue that could have taken months to reveal with talk therapy alone. Nonverbal creative expression can reveal what is needing attention just below the surface of our consciousness. Verbal expression can give the experience words and story so that it makes sense. Art Therapy and EMDR can work hand in hand in the treatment of post-traumatic stress symptoms. Please read the section on EMDR for more information.